I like to talk with people. I also help my readers and other people in various computer and web design related problems. Sometimes people request me to come on chat and sometimes on Skype. While on voice calls, the biggest problem is the pronouncing the name of another person correctly. Sometimes people do not like if a person pronounces their name wrong. But it happens very often when the name is really hard to pronounce. To avoid this kind of awkward situations, there are few tools which help in pronouncing names correctly. In this post, I am listing 3 websites which help you learn how to pronounce a word in the proper way. If you usually talk to persons of other countries, these tools will be helpful for you. 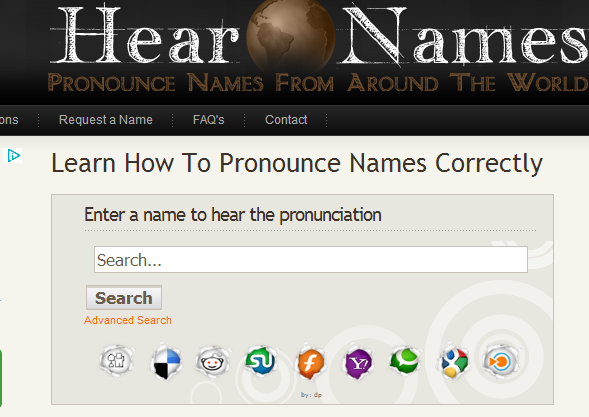 Hear Names is a nice website with the collection of millions of names. You can hear the correct pronunciations of difficult names. When you visit the website, you will see a search box. Just enter the name in the search box and the press enter to see the results. Results will show you related names under different categories. Click on Play button to listen to name. If you couldn’t find the name you were searching for, you can “Request a name” from the menu at the top. Pronounce Names is also a nice tool which helps in learning how to pronounce a word in the right way. It shows how to pronounce a word along with a voice pronunciation for better help. For few words, audio pronunciation is not available. So, if it does not have the correct pronunciation of your name, you can submit it. You can also help them to fix if they have the wrong pronunciation of a name. Inogolo is also a similar kind of tool to learn how to pronounce a name. Just visit the website and search for a name. It list the Phonetic Pronunciation along with the Audio Pronunciation. So, you can listen how to properly speak a word. This tool is helpful for both English and non-English speakers because it displays the phonetic pronunciations. You can also check the pronunciation guides available on Inogolo. Try these tools and search for few names which are hard for you to pronounce. I am sure you will find these tools helpful. You should bookmark these tools and use it regularly whenever you find a new name.